We got a call yesterday evening that the Botanica religious articles shop on Fifth Avenue in Park Slope was "fire bombed" last night shortly after 5PM. According to witnesses, and there were apparently many, several men threw devices described as "Molotov cocktails" through the windows. 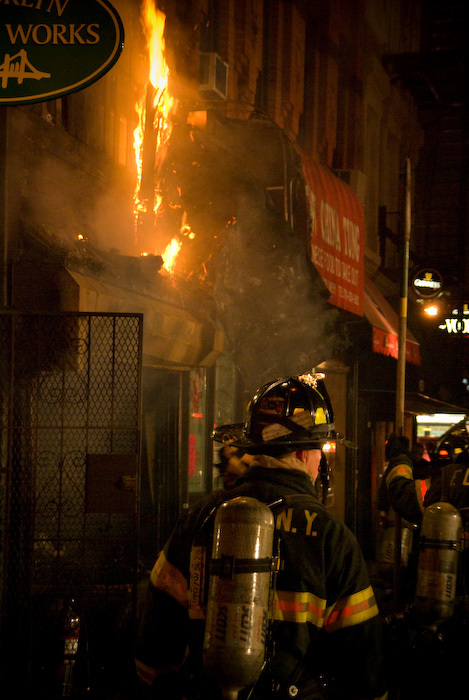 Gothamist Newsmap showed that an "arson robbery" occurred. This morning, local blogs have more info about and photos of the incident. The dramatic photo here is from Brit in Brooklyn blogger and photographer Adrian Kinloch, whose blog features two full sized photos (and which is consistently visually and informationally interesting). Dope on the Slope, who also happened by the smoldering scene, writes of the 5PM incident at St. John's place and 5th Avenue that "There were seven fire trucks and a sizable gaggle of gawkers watching the boys from Ladder Company 122 tackle a fire in the building between New China Tung and the frame shop on the west side of 5th. You could have made a fortune selling popcorn or hot chocolate. The fire itself wasn't visible, but there did appear to be some smoke damage from what I could see." Only the Blog Knows Brooklyn got an email from someone that talked to people milling around that "either some kids came by asking for money and doused the shop with gasoline and lit it and ran when they didn't get any, OR some kids threw an explosive (as in a bomb) in the botanica shop and ran." The eyewitness account of the incident that was relayed to us was that several young men broke the windows of the shop and tossed in incendiary devices. All in all, not a good evening on that part of Fifth Avenue. Personally, I don't buy this whole robbery angle. That shop does literally zero business. I don't know if they had fire insurance or what, but I'm pretty suspicious of the whole thing.